This 4-star hotel is situated next to famous Schönbrunn Palace. The Schönbrunn Underground Station is just 150 metres away and the centre can be reached within 10 minutes by public transport. 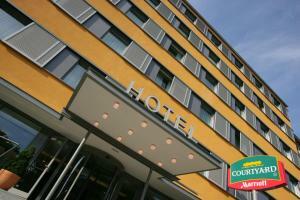 Courtyard by Marriott Wien Schönbrunn offers modern, air-conditioned rooms with flat-screen TVs, hairdryers and a work desk. Tea- and coffee-making facilities are also included in the rooms. Free WiFi is available in public areas. The Courtyard Wien Schönbrunn provides a fitness room and a parking garage for guests. The restaurant La Corte serves Italian and Austrian cuisine. Guests can relax in the lobby bar or enjoy a snack from the 24-hour market. The Schönbrunn Zoo can be reached with a 20-minute walk. Mariahilfer shopping street and Westbanhof Train Station are reachable with public transport within 15 minutes.